Having a problem with your window coverings, give us a call, we'll be glad to talk to you. Click here for our contact information and here for our location. Our Window Covering Service Center allows us to handle most warranty repairs in our shop or right in our customers' homes, rather than shipping the product back to the manufacturer. This can significantly shorten the time that your window fashion product is in the repair process. A plus for our customers that you will find at few other window covering dealers. 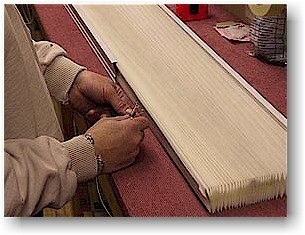 As a full-service Window Covering Service and Repair Center we carry a wide selection of genuine Hunter Douglas and Levolor parts for warranty and non-warranty repair. We've been doing repairs on custom blinds and shades since 1984 and have a large inventory of obsolete parts no longer available from the original manufacturers, including Hunter Douglas, Graber, Bali, Del Mar, Levolor, Kirsch and LouverDrape. Our Window Covering Repair and Service Center occupies over 1200 square feet in our facility in Bellevue, Washington. To learn more about The Blind Alley visit our Company Profile.